The Conference Committee has now released their Conference Report which resolves the differences between the bills passed by the House and the Senate. In a previous post, I noted those differences. In this post, I’ll note the corresponding provisions in the conference report. This final bill will need to be passed on both chambers and then signed by the president to become law. Prediction markets currently give a ~90% chance of this happening prior to the end of 2017, a ~5% chance of it passing in the first half of 2018, and a ~5% chance of it not passing at all. So this is pretty close to a done deal. Income Tax Rates – lower rates for all, temporarily through 2025, but different from both the House and Senate plans. See comparison of today’s rates vs. the rates in the final bill below, courtesy of The Tax Foundation. All rates revert to 2017 law (indexed for inflation) after 2025 unless extended by another Congress. Kiddie Tax – follows the Senate proposal, such that a child’s investment income is taxed with trust and estates rates (higher), vs. being taxed at the parent rate after a threshold. Reverts to existing law after 2025. Tax Rates for Dividends and Long-Term Capital Gains – remain as they are today. 0% applies if income puts you in the old 0%, 10%, or 15% tax bracket, 15% applies if in the prior 25%, 33%, or 35% bracket, and 20% applies if in the old 39.6% bracket. Capital Gain / Loss Tax-Lot Accounting – the provision to force First In First Out (FIFO) treatment on sales was eliminated. Current rules which allow LIFO, specific, ID, or FIFO remain in effect. Alternative Minimum Tax (AMT) – follows the Senate proposal. AMT is not repealed, but the exemptions amounts are increased and the phaseout income at which the exemption begins to be reduced is also increased. When combined with the SALT limitations and the elimination of miscellaneous itemized deductions subject to the 2% of AGI floor (see below), AMT shouldn’t impact nearly as many taxpayers as it previously did. Reverts to existing law after 2025. Standard Deduction – increased to $12k single, $24k MFJ. This increase, when combined with the SALT limitations and the elimination of miscellaneous itemized deductions subject to the 2% of AGI floor (see below) means fewer taxpayers will itemize their deductions. Reverts to existing law after 2025. Child Tax Credit – credit is increased to $2k per child ($500 for other dependents like parents), and begins to phase out at $200k single, $400k MFJ. Reverts to existing law after 2025. Adoption Credit / Credit for Plug-In Vehicles / Hope Scholarship Credit / Lifelong Learning Credit – no change to any of these. Existing law remains in effect. State and Local Taxes (SALT) and / or Property Taxes will only be deductible up to a combined max of $10k. Note that this is the same for Single and MFJ, thereby imposing a marriage penalty via this deduction. Additionally a provision was added to disallow a 2017 deduction on 2018 state/local income taxes that are prepaid so that taxpayers can’t game the system by prepaying future year’s worth of state taxes in 2017. Mortgage interest deduction would only be allowed on up to $750k of new mortgage debt (vs. $1M today), and there would be no more $100k of HELOC debt interest deduction allowed. Existing mortgages (closing prior to 12/15/2017 or with a binding contract prior to that date) would be grandfathered in the old rules. Casualty loss deduction eliminated (unless specifically authorized by special disaster relief). Medical expense deduction remains, with the AGI threshold reduced from 10% to 7.5% for 2017 and 2018 only (reverts to 10% thereafter). Misc. Itemized Deductions that are subject to the 2% of AGI floor (see IRS Publication 529 for a list of these deductions) are all eliminated. Moving expenses deduction eliminated. Reverts after 2025. Alimony deduction eliminated and alimony would no longer be taxable to the receiver. Effective starting 2019 and does not revert after 2025. Student loan interest deduction is NOT eliminated. Existing rules are retained. Tuition and fees deduction is NOT eliminated. Existing rules are retained. Sec 121 exclusion of gain on the sale of a principal residence is NOT changed. The 2 of 5 year rule remains in effect with no income caps. Retirement Accounts – generally unchanged except that 401k plan loan repayments get a little easier in the case of a termination. Rather than needing to repay the loan within 90 days of termination or treating the loan as a distribution, borrowers would have the ability to repay the loan to a new retirement plan or IRA by the due date of that year’s tax return (including extensions). 529 College Savings Plans enhanced to allow up to $10,000/year of tax-free distributions for private / homeschool K-12 expenses. Edit 12/19/17 – after Senate amendments to conform to Reconciliation rules, the “homeschool” portion of this provision was dropped. 529 withdrawals cannot be used for homeschool expenses. Estate Tax – is not repealed, but the exemption would be doubled (~$11M per person / $22M per couple). ACA Individual Mandate – repeals the “Individual Mandate” (the provision that requires everyone to have health insurance, or pay a penalty on their taxes), by reducing the penalty for not having insurance to $0. Employer Benefit Changes – No change to dependent care FSAs, adoption benefits, tuition reimbursement plans, reduced / free tuition for employees of educational institutions, pre-tax transportation plans (parking / commuting). free gym memberships. Tax-free moving expenses reimbursements would no longer be allowed though. There would also no longer be deductions to the employer for (1) an activity generally considered to be entertainment, amusement or recreation, (2) membership dues with respect to any club organized for business, pleasure, recreation or other social purposes, or (3) a facility or portion thereof used in connection with any of the above items. Over the next few days, I’ll post my thoughts on what, if anything, we can do before the end of 2017 to take advantage of (or limit the disadvantages of) the new tax laws going into effect. Stay tuned! The Senate has now released its version of the Tax Cuts & Jobs Act. I thought it would be helpful to re-post the House plan points from my last blog post and update with how the Senate plan would treat each item. Again, all of this is subject to change before a final bill is put together and voted upon. Each chamber needs to pass its version of the bill (after votes on various amendments). Then the two bills will be reconciled in Committee to produce a final bill. Then both chambers need to pass that bill. Then the President needs to sign it. Long path ahead with many changes likely. Income tax rates fall for everyone. The current 7 tax brackets would be compressed into 5: 0%, 12%, 25%, 35% and 39.6% (the 0% rate applies due to deductions and exemptions which subtract from income causing the first $x of income to be subject to no tax).. For singles, the 12% rate would run to $45,000, the 25% rate would top out at $200,000, the 35% one would end at $500,000, and the 39.6% rate would kick in for taxable incomes that exceed $500,000. For marrieds, 12% rate up to $90,000, 25% would max out at $260,000, 35% would end at $1 million, and the 39.6% rate would apply above $1 million. The 12% on the first $45k or 90k of income wouldn’t apply for those in the top tax bracket. Note that this schema reduces the marriage penalty that exists in the current tax brackets since the married brackets (with the exception of the 25% bracket) are double the single brackets. Senate Plan: 8 brackets, like today, but with different rates and caps. Those rates are 0%, 10%, 12%, 22.5%, 25%, 32.5%, 35%, and 38.6%, with the top bracket at $500k single, $1M married, like the House plan. Would also change the “kiddie tax” such that a child’s investment income is taxed with trust and estates rates (higher), vs. being taxed at the parent rate after a threshold. No change in tax rates for dividends and long-term capital gains. 0% applies if income puts you in the old 0%, 10%, or 15% tax bracket, 15% applies if in the prior 25%, 33%, or 35% bracket, and 20% applies if in the old 39.6% bracket. Senate Plan is the same and specifically calls out that only the FIFO (first in first out) method of tax lot reporting will be allowed for the determination of gain (or average cost in the case of funds). Senate Plan is the same. The standard deduction is increased for everyone, but the personal exemption no longer applies. The standard deduction would be $24k for married filers (vs $13k now) and $12k for singles (vs. $6500 now). The $4150 per person personal exemption (which was phased out for upper incomers and treated differently for those in AMT) is eliminated. Senate Plan is the same, thought the house plan eliminated the extra standard deduction for those age 65 and over and those who are blind while the Senate retains those additional standard deduction amounts. The child tax credit is increased. It would be $1600 per dependent age 16 and under (vs $1000 today). The income phaseouts are increased as well ($75k single / $115k married now to $115k single / $230k married). Senate Plan would increase the credit to $1650 per dependent, raise the age to age 17 and under, and raise the income phaseouts to $500k single, $1M married. A new, temporary $300 tax credit for each adult taxpayer and each dependent over age 16. This applies for 5 years only and essentially offsets part of the loss of the personal exemption. It also phases out at higher incomes. Senate Plan does not include this new temporary credit. Hope Scholarship Credit & Lifetime Learning Credit, though the larger American Opportunity Credit remains. State and local tax deduction eliminated. Senate Plan is the same. Property tax deduction limited to $10k per year and only applies to real estate (no more auto registration deduction). Senate Plan completely eliminates the property tax deduction. Mortgage interest deduction would only be allowed on up to $500k of new mortgage debt (vs. $1M today), only for primary residences (vs. first and second homes today), and there would be no more $100k of HELOC debt interest deduction allowed. Existing mortgages (closing prior to 11/2/2017 or with a binding contract prior to that date) would be grandfathered in the old rules. Senate Plan retains the $1M cap, but still eliminates the $100k of HELOC debt interest deduction. Casualty loss deduction eliminated (unless specifically authorized by special disaster relief). Senate Plan is the same. Medical expenses > 10% of AGI deduction eliminated. Senate plan retains this deduction. Moving expenses deduction eliminated. Senate Plan is the same. Alimony deduction eliminated and alimony would no longer be taxable to the receiver. Senate plan does not modify alimony rules. The student loan interest deduction is eliminated. Senate plan retains this deduction. The tuition and fees deduction is eliminated. Senate plan retains this deduction. Sec 121 exclusion of gain on the sale of a principal residence is significantly changed. Instead of the exclusion applying regardless of income as long as the seller owned and lived in the residence for 2 of the last 5 years, the exemption would now be phased out for upper incomers (starts at $250k individual and $500k married) and the own/live requirement would be 5 of the last 8 years. Senate Plan also includes the 5 of the last 8 condition, but excludes the income caps. Retirement accounts are unchanged (401ks, Traditional IRAs, Roth IRAs, SEPS, SIMPLES, etc. Note that there are strong rumors that the Senate plan will change this, removing or reducing the ability to save pre-tax for retirement. Senate Plan makes some changes to 457, 403b, and 401k plans so that they all use the limits of today’s 401k plans (no additional catch-up for 403b and governmental 457 plans going forward). It also clarifies that the aggregate contribution rules apply across all retirement plans, not just retirement plans of the same type. Finally, it eliminates “catch-up” contributions for individuals whose wages exceeded $500k in the prior year. Senate Plan does not include these changes. The estate tax would be reduced and then eliminated. The exemption would be doubled for 2018 and eliminated completely in 2024. The gift tax system would be kept in place to prevent gaming the income tax system by shifting assets to those in lower tax brackets. Senate Plan doubles current exemptions, but keeps the estate tax in place. ACA (“Obamacare”) provisions remain unchanged. The Individual Mandate (requiring health insurance or paying a penalty) remains, as do the other ACA-imposed Medicare surtaxes on wages and investment income. Senate Plan also leaves the ACA unchanged. No more tuition reimbursement plans and no more reduced / free tuition for employees of educational institutions. No more moving expense reimbursements. No more pre-tax transportation plans (parking / commuting). No more free gym memberships or similar amenities without including their value in taxable income. 401k hardship withdrawals would still be subject to tax and penalties, but could now include employer contributions and employees would no longer be prevented from making new contributions to the plan for 6 months. 401k plan loan repayments get a little easier in the case of a termination. Rather than needing to repay the loan within 90 days of termination or treating the loan as a distribution, borrowers would have the ability to repay the loan to a new retirement plan or IRA by the due date of that year’s tax return (including extensions). Senate Plan does not contain this language except for the moving expense reimbursements. Those would not be allowed in the Senate plan either. There would also no longer be deductions to the employer for (1) an activity generally considered to be entertainment, amusement or recreation, (2) membership dues with respect to any club organized for business, pleasure, recreation or other social purposes, or (3) a facility or portion thereof used in connection with any of the above items. Property tax deduction limited to $10k per year and only applies to real estate (no more auto registration deduction). Mortgage interest deduction would only be allowed on up to $500k of new mortgage debt (vs. $1M today), only for primary residences (vs. first and second homes today), and there would be no more $100k of HELOC debt interest deduction allowed. Existing mortgages (closing prior to 11/2/2017 or with a binding contract prior to that date) would be grandfathered in the old rules. Medical expenses > 10% of AGI deduction eliminated. Tax prep fees, and unreimbursed employee expenses (including mileage) would be eliminated. Alimony deduction eliminated and alimony would no longer be taxable to the receiver. The student loan interest deduction is eliminated. The tuition and fees deduction is eliminated. Sec 121 exclusion of gain on the sale of a principal residence is significantly changed. Instead of the exclusion applying regardless of income as long as the seller owned and lived in the residence for 2 of the last 5 years, the exemption would now be phased out for upper incomers (starts at $250k individual and $500k married) and the own/live requirement would be 5 of the last 8 years. There are many other (and mostly more complicated) changes on the corporate and small business side of things. I suspect even more of those proposed changes will be substantially modified before the final bill. In an effort to keep the length of this post manageable, I’ll refrain from getting into the Corporate changes at this time. The effective date for most of the changes, on both the Individual and Corporate side, would be the start of 2018, though that could also change. Current prediction markets (via PredictIt) imply an 86% chance of the House voting on the Tax Cuts & Jobs Act in 2017, an 81% chance of passing it (including any changes between now and the final bill) in 2017, a 47% chance of a Senate vote on their version of the bill in 2017 and a 27% chance of the Senate passing their version in 2017. There is also a market on a Corporate tax cut by 3/31/2018, giving a 65% chance of success. If those are correct, it would mean progress by end of year, but likely not passage until sometime in early 2018 (if at all). Am I working too much? If you’re like me, the answer is probably "yes". In this particular case though, I’m asking the question from a tax standpoint, specifically referring to a popular misconception about the way we pay income taxes. 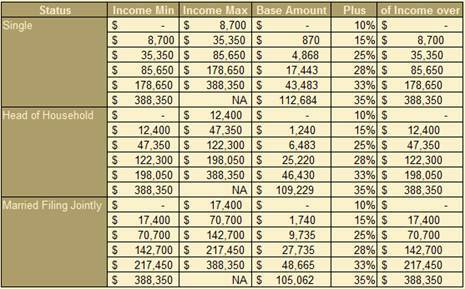 There are currently six tax Federal tax brackets: 10%, 15%, 25%, 28%, 33%, and 35% as shown in the table below from the Resources section of the PWA webpage. Your marginal tax bracket increases with your taxable (after exemptions and deductions) income. So, if you’re married and have combined taxable income of $143k, your marginal tax rate is 28%. If your combined taxable income is $142k, your marginal tax rate would be 25%. So, doesn’t this mean that you could save tax more than $1k in tax by earning $1k less at work for the year because 143k * 28% is more than $1k greater than 142k * 25%? That’s where the misconception lies. The answer is no and here’s why. Your entire income is not taxed at your marginal tax rate. You are taxed at each incremental tax rate along the way. So if your taxable income is $143k (and you’re married), you’re taxed 10% on the first $17,400 of taxable income + 15% on the additional income up to $70,700 + 25% on the additional income up to $142,700 + 28% on the last $300. You should be able to see that your tax on the first $142k is exactly the same as if you only made $142k. The only income you pay 28% on is the incremental income which puts you in that bracket. The tax code is created so that you can never make more net (after-tax) income by earning less money. Virtually everyone to whom I’ve explained this over the years, including the students in the CFP® classes I’ve taught have breathed a sigh of relief. It seems that people tend to stress a little bit over the fact that they may be making a little too much income, pushing them into the next tax bracket, and costing them a ton of money when they could have enjoyed a week of unpaid vacation relaxing on the beach and made more after taxes. This can’t happen, so don’t worry that it’s happening to you. Of course that still doesn’t mean you’re working too much, but at least you’re not working so much that it’s actually costing you money.